When you need extra help holding parts while soldering, gluing, clamping, painting, etc these are just what is needed. I filed down the teeth on the alligator clips and covered with heat shrink tubing to avoid digging into and damaging soft plastic. I have since gotten flat nose alligator tips to use with very delicate parts. 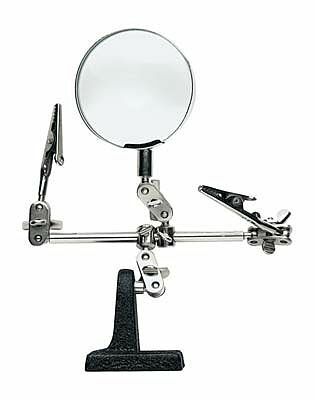 Magnifier with two alligator clips.